Carnival's Earnings Hit By String Of Cruise Ship Problems : The Two-Way The world's largest cruise line has experienced a series of problems aboard its ships, ranging from fires and power outages at sea to the wreck of the Costa Concordia. 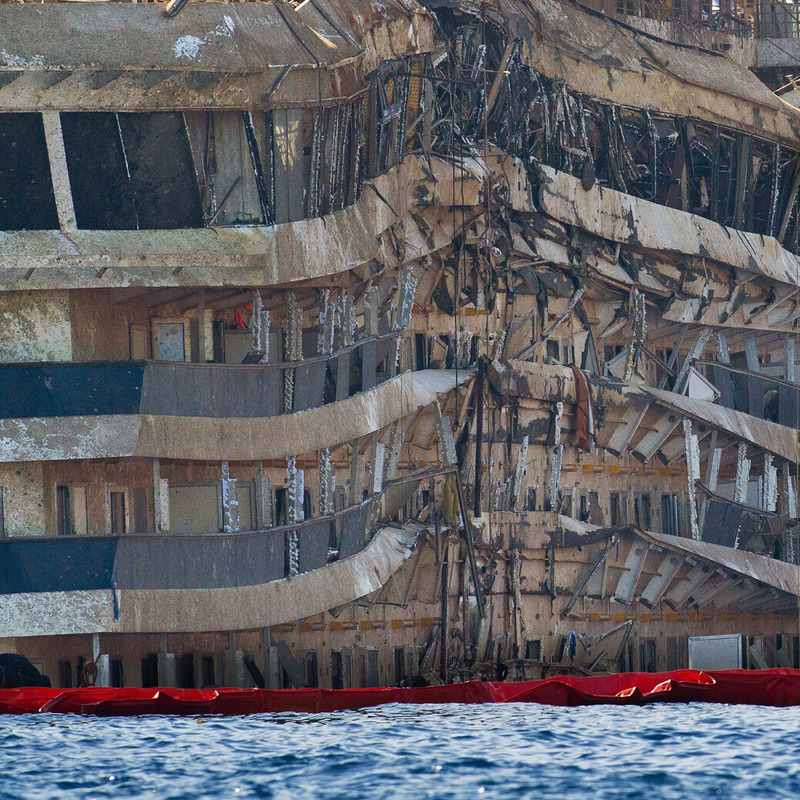 Part of the previously submerged, severely damaged right side of the Costa Concordia cruise ship is seen in an upright position last week after it was righted by salvage crews in Isola del Giglio, Italy. The company owns several cruise lines, including Carnival, Holland America, Princess and Costa, whose Costa Concordia liner wrecked on the Tuscan coast last year, killing 32 people. Carnival also has had its share of problems, including fires and power outages at sea that became public relations disasters for the parent company. Carnival Chairman Micky Arison acknowledged Tuesday that it could take as long as three years for the company's brand and reputation to rebound from the Costa Concordia wreck and other problems. "There are a lot of great brands that have had setbacks, and they've recovered ... but the economic situation in southern Europe isn't helping," Arison said at a news conference Tuesday in London, according to Reuters. "Costa is already beginning to recover, studies of acceptance suggest it [the brand] has recovered nicely," Arison said, according to the news agency. He added that it would take "two to three years" to get the brand back to where it was. Arison's comments come a week after the completion of a massive operation to right the capsized Costa Corcordia, which had been lying on its side since the accident in January. The liner's captain is on trial in Italy on charges of manslaughter and abandoning his stricken vessel. Testifying on Monday, Capt. Francesco Schettino blamed the ship's helmsman for steering the wrong way as he tried unsuccessfully to avoid hitting a reef off the coast of the island of Giglio. On Tuesday, according to The Associated Press, Schettino got "some support during his trial from an unexpected corner: representatives of the tragedy's many victims." " 'Schettino is the only defendant, but he's not the only one responsible,' said Daniele Bocciolini, a lawyer for several survivors in a civil suit attached to the criminal trial, according to the news agency. 'He's not responsible for the lifeboats that couldn't be launched nor for the emergency generators' that failed."